pebblewriter: Are We There Yet? SPX closed down 8.30 at 1329.47, down 3% from the high of 1370. The Asian markets are mostly flat or mixed, with the e-minis indicating a slight rebound. The weekly charts look abysmal, but there's still the possibility that we'll bounce off these levels for one last push. In addition to the below-mentioned trendlines, the 50 day EMA and .618 fib lines would offer support at 1323. And, am I the only one underwhelmed by the volume accompanying today's decline? Other considerations include TICK, DVOL TRIN and the A/D -- all of which have thus far failed to confirm the downturn. Also, the USD is probably due for a bit of a breather. And, at this late hour, the hourly e-mini charts leave open the possibility of a near-term bottom. The VIX is breaking out, as would be expected if the decline is real. 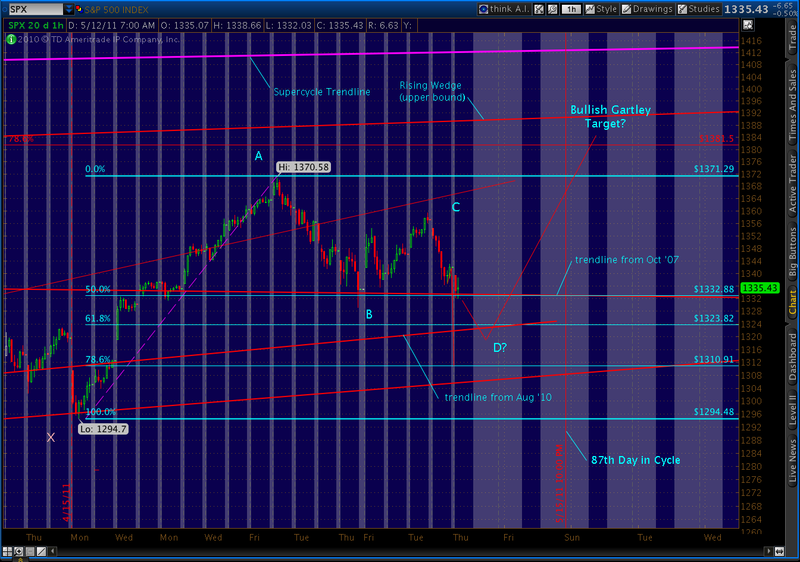 But, at these prices it has nearly completed a bearish Gartley Pattern that started on May 6. Of course, bearish for VIX means bullish for stocks. It would complement the bullish Bat Pattern detailed below. Lastly, don't discount the Fed's determination to avert a crash. We have some oft-manipulated economic indicators coming out in the morning (housing starts and building permits.) And, any positive news on the debt ceiling (or even QE3?) might turn things in a flash. If the decline is arrested here, the market's vulnerable to a short squeeze. Given that Friday is OPEX, it's easy to imagine one last turn of the screw for this past week's put buyers. Feels a bit like a bear fake-out to me. Unfortunately, as a frequent victim, I have more than a passing acquaintance with how they feel. We've bounced three times today (5th in 3 days!) off the 2nd Biggest Baddest trendline on my charts -- the one that started at the Oct '07 highs at 1576 [see The Trendline That Just Won't' Quit on May 5]. Today, it sits at about 1332. We have additional support at that same price from the .50 fib retrace (of the 1294 to 1370 move.) 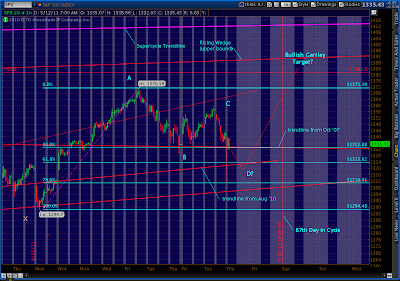 One way or the other, this descending triangle is just about done. Below here, out next major support is the trendline from August '10, with touches on 3/16 and 4/18 -- currently around 1326. I suspect we'll be there within the next 7-10 days, in time to stay within the 105 upper limit (June 3) of the 87-day cycle [see Sure It Works Fine in Practice, May 10.] After that, we should officially start P down with a 10-12% or more decline. An alternative view is that this cycle decline will be on the lower end of the scale. The smallest over the past 4 years was 3.88%, which would indicate 1315 or so. That would also mark the lower bound of the Mar '09 rising wedge. If we stalled here at 1331, we'd be down only 2.9%. Not bad, but not in keeping with the cycle pattern over the past 4 years. (1) we're entering [v] up to 1381-1390 before starting a big P down. If we close above 1344 today or tomorrow, I'll favor this route. (2) we're going to fall to 1310-1315, bounce off the lower bound of the rising wedge up to 1381-1390 before starting P. This will be easy to spot, because we'll fall decisively below the above-mentioned trendline at 1332. (3) if we don't stop at 1310, the next levels of support aren't until 1295 and 1249. Weekly MACD, RSI and STO are all trending down and show plenty of room on the downside before we're oversold. Make no mistake, this market is one sick puppy. The only question is whether he limps over to the side of the road and croaks right here, or whether he's got a little fight left in him. We should know in the next day or so.